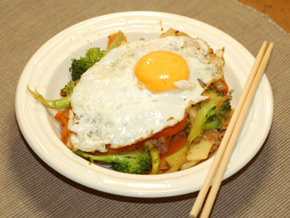 This dish was inspired by the food served in one of my favorite restaurants when I lived China. The friendly owner used rice as the main base for the dish but this lower glycemic index version has substituted extra vegetables. You can vary the recipe with different vegetables or by adding meat. Slice the onion and carrot. 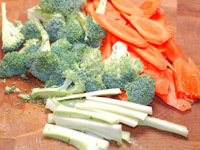 Cut the broccoli stalk free from the spears/florets and cut each spear length ways into halves or quaters. Cut the stalk into small strips. 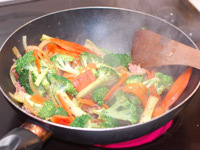 Fry all vegetables (and bacon) except the broccoli spears in the olive oil for 3 minutes. Add the soy and Worcestershire sauce and spears and fry for a further 2 minutes. 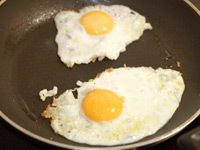 Fry the eggs to your liking in 2 teaspoons of olive oil in a good non-stick pan. Sprinkle the eggs with a small pinch of salt and ground pepper. Serve on top of the vegetables.